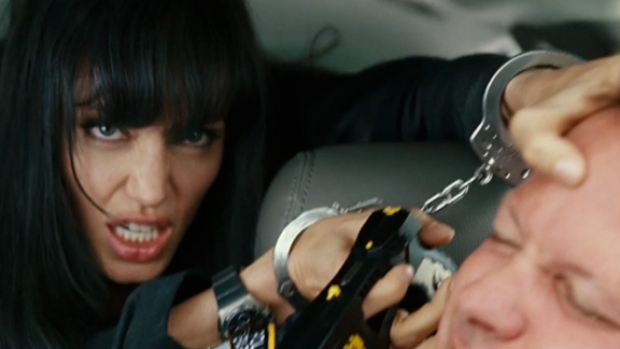 Review: Jolie Brings Taste of Bourne to "Salt"
PopcornBiz Takes Former Spies to See "Salt"
"Salt," the new spy thriller starring Angelina Jolie, owes a great debt to the Bourne series, both in its story and look. Jolie's lone-wolf super-spy is every bit as tough as and almost as inventive, but lacks the pure hard-charging energy of Matt Damon's Jason Bourne. Still, there's plenty of fun to be had in falling short of the "Bourne" Trilogy. Evelyn Salt is a CIA agent who, during the course of interviewing a Russian defector, is accused of being a mole planted in the United States by the KGB. She is allegedly part of a maniacally ambitious plot to start World War III and return Mother Russia to her past glory as a superpower. Even speaking as a member of the last generation raised to be scared witless by anything bearing a hammer and sickle, having the boogeymen be the Russkies seems like an odd choice. History has shown the former USSR to have been an epic bust. These guys couldn't make a 5-year plan work, how on Earth could they pull off something this complicated? It's funny, after the fall of the Berlin Wall, aliens from outer-space became the go-to baddies in Hollywood. Now, with the U.S. fighting wars in both Afghanistan and Iraq, the Russkies are the silver-screen evildoers once again. Director Phillip Noyce has crafted plenty of taut, suspenseful action, some of it delightfully cartoonish in its excess, but the film hits some unfortunate and unnecessary snags in its periodic flashback sequences. The scenes are mostly an attempt to give background on the romance between Salt and her husband, Mike, a German arachnologist, but so much of what we learn about them does nothing to help move the story along. Worse still, August Diehl, who did some nice work as a menacing Nazi in "Inglorious Basterds," comes off as a slab of milquetoast. He's an unimportant piece of the puzzle, who only distracts us from the intrigue at hand. Much has been made of the fact that Tom Cruise was originally attached to star as "Salt," and hindsight being 20/20, Cruise's career revival would have been better served by doing "Salt" rather than "Knight and Day," even if it meant inevitable comparison to Ethan Hunt. Once Jolie was cast, all involved wanted to avoid sexualizing the character, a smart decision to which all stayed true. It was a smart choice that serves the film well, though it seems odd that a woman who looks like Angelina Jolie wouldn't be objectified even once in the course of a 100-minute jaunt through such a high-testosterone landscape. Liev Schreiber plays Salt's immediate superior and close friend, Ted Winter. Considering how well Schreiber does menacing, he feels a bit wasted playing an earnest do-gooder. But he fares far better than Chiwetel Ejiofor as Peabody, the counter-intelligence agent tasked with finding out the truth about Salt. The character is devoid of any depth, and worse yet, he's at the center of the worst stretch of dialog in the worst scene in the film. He's a talented guy who deserves better. For all its faults, "Salt" is a fun piece of genre filmmaking full of high-powered action, car chases, shootings, underground bunkers and one of the more imaginative PG-13 killings in recent memory.